There’s no mystery to automotive maintenance, in fact it’s all rather simple and there are many things you can do right at home. One of the simplest things is cleaning your battery terminals. With just a few tools you can keep your battery in great shape and avoid costly early replacement. Many people get nervous around electricity but a car battery is actually quite safe to work with. It takes some severe mistakes to cause real damage to yourself or your car. So don’t be afraid to dig in, get dirty and clean those battery terminals. It will make your battery last longer, make it easier to jump start your engine and help you to avoid needing replacement battery cable ends. First things first. When you’re cleaning your battery terminals it’s smart to know a little about battery safety. Car batteries are quite safe as long as you pay attention to what you are doing at all times. A mistake can result in some sparks, damage to your vehicle or severe injury to yourself. Don’t Touch Metal to Metal: Never let anything metal touch a battery terminal and something else metal at the same time. Always be aware of where your tools are and how you are holding them. A common mistake is to bump something metal while you are loosening or tightening a terminal end. Go Slow: Go slow and take your time when cleaning your battery terminals. Going fast and getting careless can lead to accidentally letting a wrench slip and arcing the battery. Hold your tools carefully and use two hands to make sure you don’t slip. Keep Tools Away: Keep any tools you are using away from the battery. Put them on a bench in your garage or on a part of your car away from the battery. You don’t need much to clean a battery terminal but placing one wrench on top of your battery while you remove a terminal end is a sure way to cause an accident. Wrenches or Sockets: A basic set of wrenches or a simple socket set will be all the tools you need to remove the terminal ends. Most new cars use metric nuts but in a pinch a set of standard tools will usually do as well. Wire Brush: To actually clean the terminals you’ll need a wire brush. Most places that sell batteries will also sell special brushes for cleaning them. If you don’t want to spend the money then any small wire brush will do the trick. You can also get a wire brush for battery terminals from Amazon cheap! Shop Towels: You’ll need something to wipe things up. Shop towels work great. If your battery is really dirty a shop vacuum is great for sucking out the dust. Cleaning Spray: If you want to go all out then pick up a can of battery terminal cleaning spray. This special spray is designed to neutralize acid and break up tough corrosion. It’s only a few dollars for a can and highly recommended. The first thing you’ll need to do is disconnect the battery before you clean it. This part of the job is where you’re likely to make the most mistakes. It’s important to be very careful during this part and do exactly as instructed. Identify Battery: Pop the hood and find your battery. You may have to remove a cover. Look at the terminals and see what you have to deal with. If the nuts you have to loosen are covered in corrosion (a blue-white powder) then brush it off with the wire brush. Remove Negative Cable: Find the negative post and cable. The cable will be black and there will be a (-) symbol next to the battery post. Select a wrench or socket that fit on the nut and carefully loosen it. Do not remove the nut. Put your tool in a safe place then wiggle the cable until it comes loose. If it doesn’t budge, carefully use a flathead screwdriver to pry it loose. If it still won’t come loose then you might need to see a mechanic. Prying too hard can damage the plastic case and ruin your battery. If it does come loose, wrap a towel around the metal cable end and tuck it somewhere safe and away from metal. Remove Positive Cable: Repeat the directions above for the positive cable. The positive cable is usually red and on the battery the post will be marked with a (+). Ensure Cables Are Secure: Once the battery is disconnected and your tools are out of the way you are safe. Just like any other battery, you can touch the battery posts freely and you won’t get shocked. Just make sure that the battery cables are safely tucked away and won’t pop free. You don’t want them bumping a post in the middle of the battery cleaning process. The battery posts, the metal nubs on top of the battery, get dirty over time. Dust, oil and of course corrosion build up and can cause problems. 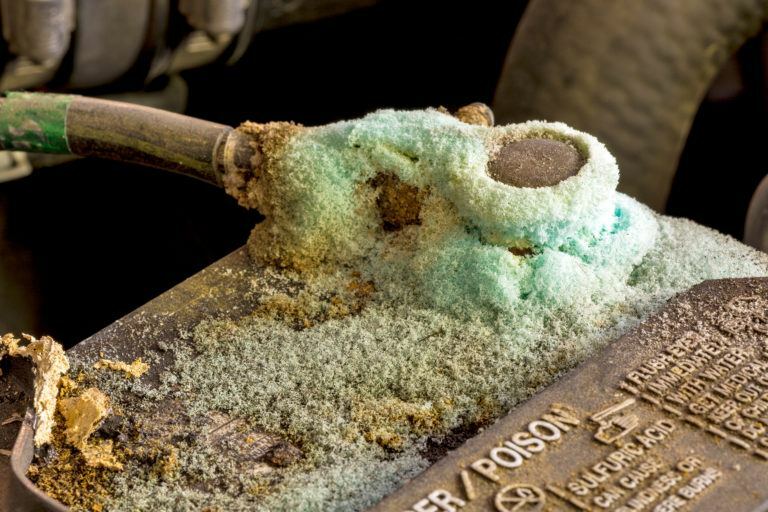 Corrosion is the blue-white powder that builds up on top of batteries. This is caused by small amounts of acid leaking out around the posts and reacting with the metal. Over time it will eat away at the metal and you’ll need new cable ends if you don’t clean your battery terminals regularly. Safety: The corrosion powder is relatively harmless if you touch it but you don’t want to breath it in. If there is a considerable amount you have to brush away then wear a dust mask. Breathing in sulfuric acid powder isn’t fun. Spray Cleaner: If you bought some battery terminal cleaning spray, spray a few blasts over each post. Let it sit for a few moments. It will neutralize any acid and eat away at the corrosion. After that you can simply wipe it away with your shop towels. If you didn’t get cleaner then simply wipe away any dirt or corrosion with your shop towel. Brush: After the big stuff has been cleaned away you can use your wire brush to deep clean the battery posts. Concentrate on the sides where the cable end clamps onto the post. When the posts are shiny and free of corrosion you’re all set. After the posts are looking good you can get to those cable ends. Be Careful: Clean the battery cable ends one at a time. You probably won’t have much extra cable length so you’ll be cleaning close to the battery posts. Be careful with your tools so you don’t accidentally connect the post with something else metal while cleaning your battery cable ends. Spray: If you have cleaner you can use it on the cable ends too. Place the cable end on top of a few shop towels and spray it with cleaner. Let it soak then wipe it clean. Brush: Take your brush and clean the entire cable end. Focus on the inside where it holds onto the post as well as the nut and bolt. Inspect: After it’s clean, inspect the cable end for damage. Over time, thinner cable ends can crack and cause loose connections. If you find one is cracked you should have it replaced. Once everything is clean you’re all set to put things back together. Be sure to follow the directions below. Positive First: Check that the negative cable end is safely tucked away and not touching anything metal. Then reattached the positive cable end. You don’t have to tighten them too much. If it doesn’t move when you wiggle the cable then they are tight enough. Negative: Repeat with the negative cable end. Just remember to be careful with your tools and not spark against the positive end. Prevention: Using a corrosion prevention spray can help reduce the need for further cleanings. Spray a little on each terminal before you wrap up. You can find Corrosion Prevention Spray on Amazon. Reinstall Cover: If you had a battery cover, reinstall it now. You are all done! Make sure any tools and rags are removed from under the hood.